YOU HAVE TO hand it to Sony – no matter what the competition has come up with in recent years, it has stuck to its design guns. While Samsung has added curved edges to its phones, and HTC has veered from composite to stark metal and is now producing curvaceous all-glass handsets, Sony’s Omni-Balance design and squared-off shape is alive and kicking in the firm’s 2017 flagship, the Sony Xperia XZ Premium. Sure, it’s slightly different to previous Xperia flagship models – the edges have a curved rather than softly squared profile, and the corners are severely chopped off and sharp instead of being softly sculpted – but it’s as distinctive as any smartphone on the market, and that’s a great credit to Sony’s design department. The glass panels on the front and rear have both been treated with an oleophobic coating, so there’s no problem with fingerprints as there is with the HTC U11. It looks good in general, with chamfered edges at the top and bottom of the phone, as well as softly rounded sides and attractive colour choices. We were sent the Deepsea Black model, which looks great, but it’s also available in Luminous Chrome for those who like their phones shiny. However, compared with the narrow-bezel, curved-edge design of the Samsung Galaxy S8, the Xperia XZ Premium’s squareness does seem a little old hat. There are practical problems with the way this phone has been designed as well; its sharp corners are ready and raring to tear a hole in your pocket if you get your angles wrong when pocketing it, and they dig uncomfortably into your palms and fingers when the phone is held horizontally. That’s a great shame, because there’s very little missing here when it comes to checklist features. The phone is weather-proofed to IP68, just like the Samsung Galaxy S8; you can add a microSD card to expand its 64GB of built-in storage; there’s a fingerprint reader positioned sensibly on the right-hand side of the phone; and there’s a dedicated two-stage shutter button for the camera. On the top edge is a 3.5mm headphone jack, and on the bottom is a USB Type-C port for charging and data transfer. Oddly, despite the fact that the Sony Xperia XZ Premium has a Qualcomm Snapdragon 835 processor, it doesn’t support the latest Quick Charge 4 standard, only Quick Charge 3. There is at least Gorilla Glass 5 on the front and rear, so it should resist scratching and scuffing, though it will most probably break if you drop it directly on to concrete. Still, it’s not the design that Sony is selling the XZ Premium on: it’s the camera and its ability to capture ultra-slow-motion video footage at 960 frames per second. It can only do this in short bursts, and your subject needs to be well lit so your clips aren’t ruined by noise, but if you have the imagination to make your clips work, it works brilliantly and the clips look stunning. Just select the slow-motion mode, start recording and when you get to a bit you want to slow down, hit the slow-motion button. Beyond this slightly gimmicky mode, though, the XZ Premium’s rear camera is excellent. It’s a 19-megapixel snapper with an aperture of f/2.0, predictive phase detect and laser autofocus for quick lock-on in both well-lit and low-light conditions. The sensor is a 1/2.3in model, too, so the same as all its major rivals. As for the front-facing camera, that’s a 13-megapixel, f/2.0 camera with a 1/3in sensor. Compared with the Google Pixel, which arguably still has the best overall camera on a smartphone, the specifications are very similar. However, with a higher pixel count, the Sony XZ Premium’s camera promises and delivers visibly crisper details in good light. 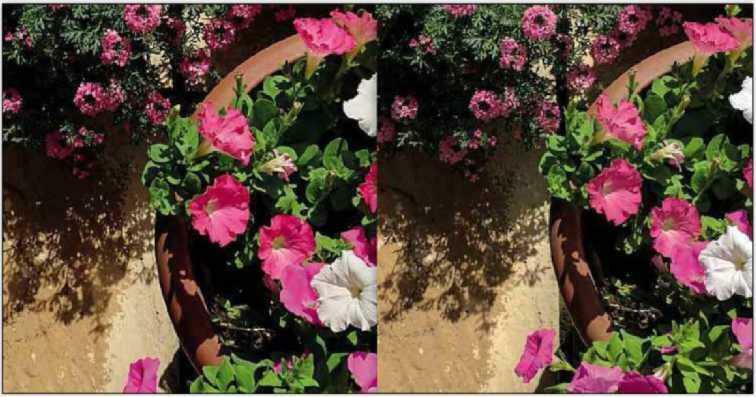 The Sony handset’s images are more vibrant than the Pixel’s, too, although a touch oversaturated to our eyes. Take a closer look, though, and you’ll start to see more serious problems. The XZ Premium’s camera seriously oversharpens things, with the result that some fine details are lost. It’s a small difference, but a noticeable one. What’s more, Sony’s HDR mode simply can’t match the Pixel’s when it comes to balancing out tricky exposures. Where the Xperia XZ falls even shorter is in low light. The software’s tendency to oversharpen everything makes noise worse, obscuring detail and introducing heavy grain in shadowy areas, despite using the same shutter speed and ISO settings. It’s still a decent snapper if you’ve got favourable lighting to work with, but it’s not up to the Pixel’s standard. The display, on the other hand, matches up well. As with last year’s Xperia Z5 Premium, the XZ Premium has a 5.5in, 3,840×2,160 screen, packing in even more pixels than the Samsung Galaxy S8, the LG G6 and the Google Pixel. There is one big caveat: apart from the fact that it’s quite hard for the eye to tell the difference between 4K UHD and QHD on a display this size, most of the time the XZ Premium isn’t actually rendering at 4K, it’s simply showing upscaled 1080p instead. This isn’t really a problem in practice, as the screen looks perfectly sharp – as sharp as on any other 2017 flagship – but 99% of the time, you simply won’t see the benefit over native QHD. Only VR fans will notice a real difference, and VR games still aren’t rendered in true 4K. The display is HDR-enabled, which should be a bigger deal, but there’s a problem here, too, in that there simply isn’t much HDR content available for mobile phones yet. Although Amazon and Netflix both offer 4K HDR content via their smart TV apps, the mobile equivalents are yet to do the same. XZ’s screen is bright, with a measured peak luminance of 524cd/m2, and brilliantly vibrant. Its contrast ratio is superb, too, at 1,116:1. In fact, everything from movies to photos looks fantastic; in terms of overall quality, only the Samsung Galaxy S8 surpasses it. Perhaps the biggest negative thing to be said about the XZ Premium’s display is that it is power-hungry. That’s reflected clearly in our video-playback battery test, where we calibrate the screen to a set brightness of 170cd/m2, engage flight mode and play a video until the battery dies. The XZ Premium lasted a mere 10h 1m – a long way behind the Galaxy S8, Pixel XL, HTC U11 and OnePlus 5. However, in everyday use, the XZ Premium performed better. Monitored with the GSAM battery-monitor app over a week of use, we recorded an average of one day and 6.6 hours of use from a single full charge. That’s enough to last comfortably from rising to bedtime every day with moderate use; it’s still not as good as the Galaxy S8+’s average of one day and 11.2 hours, but it’s not that far behind. Performance-wise, there’s more good news. With a Qualcomm Snapdragon 835 throbbing under the hood, plus 4GB of RAM, an Adreno 540 GPU and 64GB of storage, this phone is ready for anything you can throw at it. Its Geekbench 4 multicore score of 6,412 is up there with the best of them, and its showing in the single-core test – scoring 1,884 – was very respectable as well. It’s also well equipped for smooth gaming, as shown in its GFXBench Manhattan benchmark results: 58fps in the offscreen 1080p test, and 56fps in the onscreen native-resolution test. Normal use is slick all round, with even intense multitasking causing no slowdown. The camera app felt particularly responsive, which is great for an area in which many manufacturers don’t optimise for performance all that well. Comparing flagship smartphones in 2017 is a task based on small margins. Every premier release this year has had its merits, and that holds true for the Sony Xperia XZ Premium. The screen is great, it’s fast, its camera has that rather cool slow-motion feature and, unlike the iPhone 7, it has a 3.5mm headphone jack. Unfortunately for Sony, the Samsung Galaxy S8 has dropped in price to the point where it’s about £70 cheaper than the Xperia XZ Premium, and there’s little that the latter can muster in order to justify the extra expense.